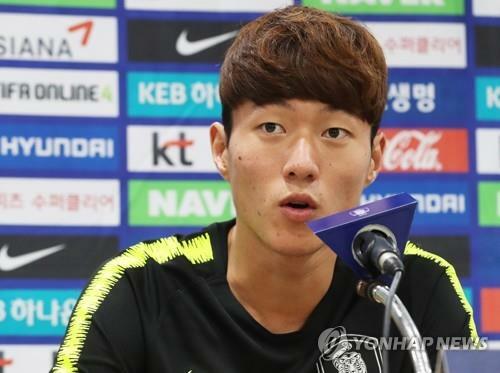 SUWON, South Korea, Sept. 10 (Yonhap) — South Korean striker Hwang Ui-jo said Monday he will work harder for the senior national football team than he did at the Asian Games. Hwang was one of the three overage players for South Korea’s under-23 side that won gold medal at the 18th Asian Games in Indonesia. He showed superb goal-poaching skills at the Asian Games and scored nine goals in seven matches. But with Paulo Bento’s senior side, Hwang said he needs to be more focused on the pitch. Hwang, who is playing with Gamba Osaka in Japan, is one of the 24 players selected by head coach Paulo Bento for friendly matches with Costa Rica and Chile. He played roughly 25 minutes as a second-half substitute in South Korea’s 2-0 win over Costa Rica on Friday but failed to score. South Korea will face Chile in Suwon on Tuesday, and Hwang said he is ready to score goals when he is given the opportunity on the pitch. The last time Hwang scored for the senior national team was in October 2015, when South Korea faced Jamaica in a friendly — his only goal for South Korea in 12 appearances. For the striker position, Hwang is competing with FC Augsburg forward Ji Dong-won, who started against Costa Rica. Hwang said under Bento, strikers are being ordered to make more runs and create chances for their teammates. At the Asian Games, Hwang received a lot of help from Son Heung-min, who played behind him as an attacking midfielder. In the match against Costa Rica, the Tottenham Hotspur star played as a left winger and supported his teammates. Chile, ranked 12th in the latest FIFA rankings, are considered stronger opponents than Costa Rica. Hwang said all players are determined to collect a second straight win with Bento.